Lawrence University students, faculty and staff were out and about in big numbers Monday as they responded to the call to service in honor of the teachings of Dr. Martin Luther King Jr. They took part in multiple volunteer efforts at area Boys and Girls Clubs, Feeding America, Brewster Village and Riverview Gardens, participated in an OxFam Hunger Banquet to get a deeper understanding of issues that keep families trapped in poverty and took part in faculty teach-in sessions on topics ranging from systematic racism to youth mental health. That was a lead-up to Monday evening’s celebration at Memorial Chapel, a chance to embrace Dr. King’s legacy and reaffirm a commitment to carry his message forward. Dr. Eddie Moore Jr. speaks during Monday’s Dr. Martin Luther King Jr. Celebration at Memorial Chapel. 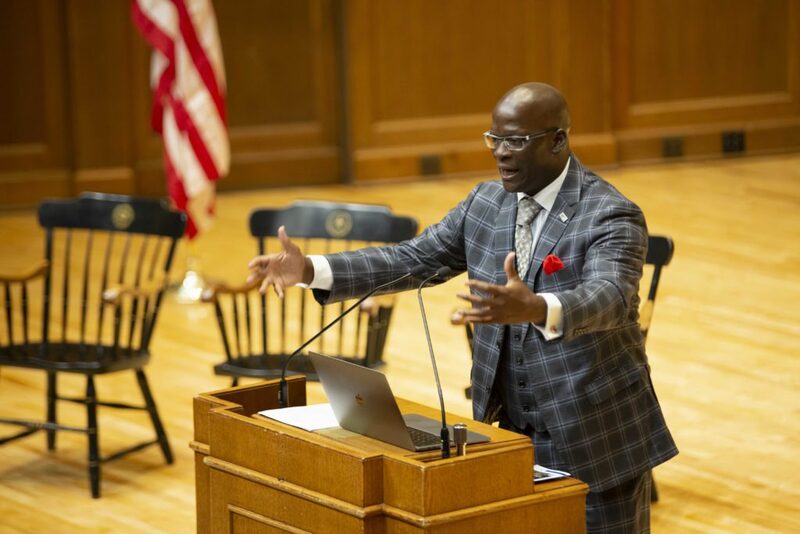 Keynote speaker Dr. Eddie Moore Jr. implored the nearly full house at the chapel to be active and vocal in pushing King’s messages of inclusion and equality. The day of service on MLK Day has been a tradition at Lawrence since 2003. “It’s a day on, not a day off, for service,” said Kristi Hill, director of Lawrence’s Center for Community Engagement and Social Change. Nearly 300 students, faculty and staff took part in the various service projects. “Lawrence has made a commitment to build students who are change makers,” Hill said, calling Monday’s activities an opportunity for students and faculty to “learn, serve and celebrate” in Dr. King’s name. The OxFam Hunger Banquet, held at the Warch Campus Center, featured a simulation to highlight issues and laws that keep people cut off from needed resources, stifling opportunities to escape the brutal cycle of poverty. The session looked to raise awareness of poverty and hunger issues here and around the world and inspire those participating to become active in fighting inequalities in access to resources. Organized by the LU Food Recovery Network, it was a first-time event and drew upwards of 90 participants. “It’s an opportunity to learn about equity in our communities,” Hill said. The service excursions around the Fox Cities gave participants a chance to engage with youth, interact with community elders and do work that assists area food pantries. The Brewster Village program, created by Vicky Liang ’19 as part of the Building Intergenerational Relationships partnership between Lawrence and the Outagamie County rehabilitation and long-term nursing facility, had Lawrence students working with elders to create six-word memoirs to reflect their lives. “We’re trying to raise awareness of the loneliness,” Liang said as Brewster Village residents paired up with Lawrence students around tables in the community room, engaging in conversations that tapped into memories and brought reflections of lives lived. Lawrence University student Beatrice Gee interacts Monday with kids at the Boys and Girls Club in Menasha. 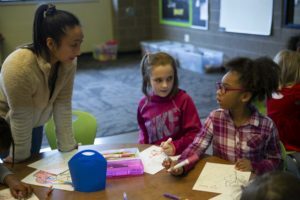 At the Boys and Girls Clubs in Appleton and Menasha, a program organized by Sam Taylor ’19 had about 50 Lawrence volunteers talking with about 300 K-6 students about the work and legacy of MLK. At the Menasha club, students in one room gathered in circles to talk through “Wings,” a book by Christopher Myers that tells the story of a boy born with wings who is shunned and mocked by his peers because he’s different and a young girl who finally gathers the confidence to speak up on his behalf. Sophie Dion-Kirschner ’20, one of the Lawrence volunteers, said she believes the messages being delivered and the connections being made are a benefit to both the youngsters at the Boys and Girls Club and the Lawrentians who stepped up to volunteer. “They all get something out of it that they weren’t expecting,” she said. 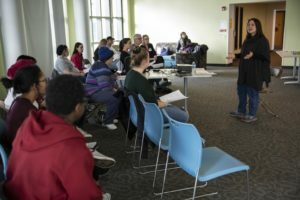 Five professors, meanwhile, hosted teach-ins in various residence halls, informal gatherings to talk about issues of education, diversity and inclusion. Students were able to come and go, joining in the conversation as they saw fit. Professor Lori Hilt conducts a teach-in Monday at Hiett Hall. Professor Stephanie Burdick-Shepherd talked about systematic inequalities in education; Professor Mark Jenike talked on hunger in a wealthy nation; Professor Lori Hilt on improving youth mental health; Professor Jason Brozek on the global climate justice movement; and Professor Jesus Gregorio Smith on systematic racism. Turning that dream into action takes work, Moore said. That’s true, he said, no matter how committed you are or how deeply you believe in all that King preached. Speaking of doing the work, the annual Jane LaChapelle McCarty MLK Community Leader Award was presented to Norys Pina, who has been a leading advocate in the Fox Cities on immigration issues and a vocal resource in the areas of access and equality. She’s a lead organizer of Unidos por un Futuro Mejor – Fox Cities and works as a volunteer coordinator for the Fox Valley Literacy Council. She is the 25th recipient of the honor, first awarded in 1995. Winners of the annual youth essay contest read their essays during the MLK celebration. They included Feyikemi Delano-Oriaran, a second-grader at Classical School in Appleton, Lilyanna Pieper, a sixth-grader at Huntley Elementary School in Appleton, and Catlin Yang, a senior at Kimberly High School. More photos: See photos from Monday’s MLK Day events here.